A year ago my best friend and I decided to meet up somewhere overseas. As I had just moved to the UAE (Abu Dhabi) and we had been getting into running together again, we wanted to do something that would motivate us to keep training on our own. 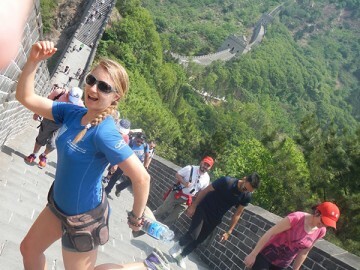 Thus, we decided to attempt the Great Wall of China Marathon. 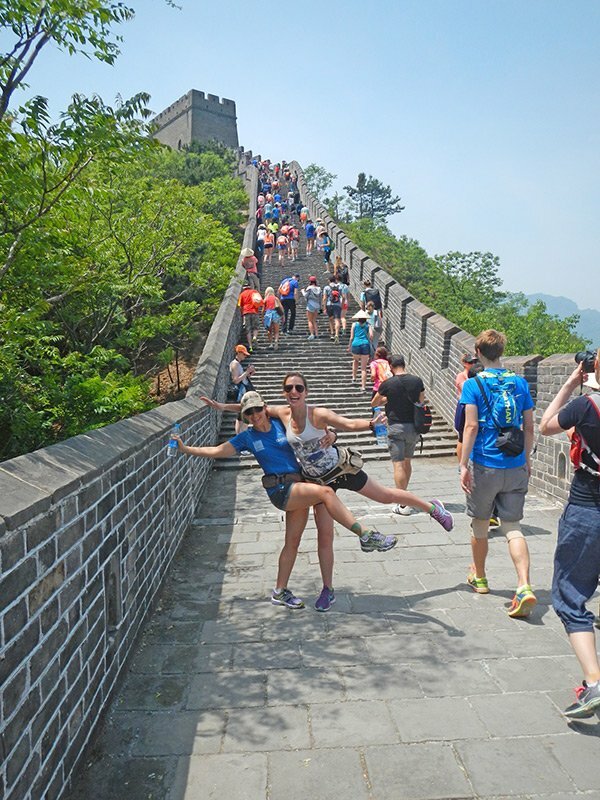 A marathon is 42.2km, and this one includes 5216 stairs on the Great Wall itself. 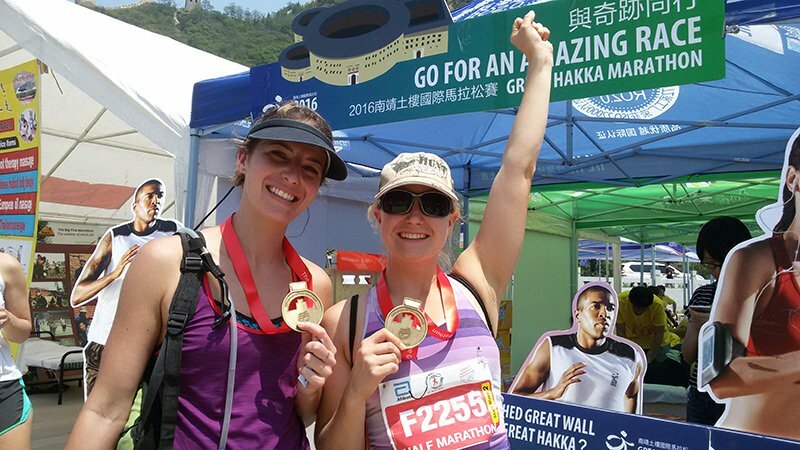 It has been described by many as one of the most challenging marathons in the world. 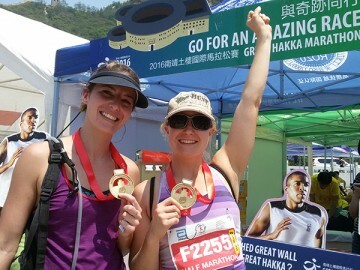 We were excited about our goal and downloaded the marathon training plan as provided by the organisers of the race. There are two training guides, each 4 months long: a basic one and an intermediate one. We decided to start with the basic training plan, and as we had so much time, we could take a week or two off after completing the basic training before moving on to the intermediate plan. I started walking short distances (3-5km) 3-4 x/week in July 2015. By August I had progressed to jogging these distances, and then I began to follow the basic training plan. As I did not have access to a gym back then and I didn’t have many hours to teach yoga (I am a mobile yoga instructor), I spent time on the road outdoors, either early in the morning, or late at night. I figured that training in the heat and humidity would help me in the long run and help to make the race a little easier to handle. It felt good to be outside, working towards such a great goal – even though it was always over 30 degrees C, with a minimum of 50% humidity. After a few weeks of the body acclimatising to regular jogs, the distance (and time on the road) began to gradually increase. The basic training began with an average of 15-20km/week, 3 rest days and one day of cross training (cycling or swimming). Each week progressed, by adding +/-3km, with some sprint training to the last session of each week. I felt good about this, and by the end of August I was teaching around 6 hours of yoga/week and assisting with summer camp. However, during September I began to teach a lot more. I went up to teaching 16 hours of yoga/week. I was still running 4 days/week and swimming once or twice a week. Subsequently, I had 0 rest days. Back then, I figured that even though I was teaching yoga – maybe 3 or 4 hours a day – it counted as a rest day, if I wasn’t running. By the end of September, I was running 30-40km/week. 3 days of shorter runs (5-10km) and a longer run (14-21km), along with a day or two of cross training (+/- 1.5km swim). “Yes! I can do this! I will do this. I must! I am going to do that marathon and I will carry my friend if I have to!” These were the kinds of thoughts I had back then. However, I was exhausted, but did not admit it to myself. October came and I was now teaching +/- 20 hours of yoga per week. I came to realise how exhausting it was, to teach yoga: to drive between classes, to talk for a large amount of that hour, to demonstrate and practice most of the class with the beginners, and then to drive almost an hour back home late at night. My determination to have an impeccable training routine drove me to be up early the next morning, going for my run. Regardless of the weather, I went out. Regardless of how lousy I felt, I went out. 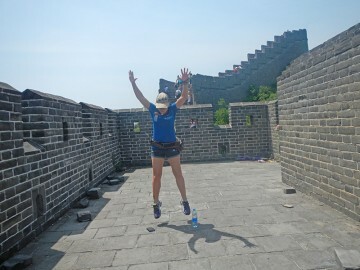 I had a few truly miserable runs – when the humidity was close to 100% (that thick fog that rolls in across the desert and stays until around 9am) and the temperature is 35+ degrees C. I suffered heat exhaustion, and after my long runs (which sometimes took 3 hours to complete 20-25km), I was useless for the rest of the day. If I didn’t go for my run, I felt like a failure and would berate myself for it. By the end of, I had burning pain in my knees. It began gradually, and I ignored it, pushing through it. It became worse and eventually affected the way that I taught. I could no longer do anything that involved placing weight on my knees. They hurt after every class I taught, after every run. The pain would sometimes wake me up in the middle of the night. I went to see a doctor (an orthopaedic surgeon) and after x-rays and a bone scan, he said that I had runner’s knee. Anti-inflammatories and rest would solve the problem. I’m not one to take tablets or medication in any form, but I had to do something to deal with the pain. I took the anti-inflammatories for 6 weeks, and the pain did begin to subside to a tolerable level. I reduced the amount of km I ran/week and changed the way I taught my classes. No longer did I do the whole class with my clients. By November, I was running only short distances a couple of times a week (and still swimming once or twice a week. It helped with reducing the pain.) I participated in a sprint biathlon (beach run and swim) at Saadiyat Beach, which was great fun. I also participated in the Yas Half Marathon on 21 November, and completed it in 2 hours. It was empowering to know that I could still do something, even though I experienced pain in my right hip for the last 7km. I was disappointed that I couldn’t complete it in under 2 hours (I had been hoping for 1:50), but was grateful to have made it in a respectable time anyway. I bought a new pair of running shoes at the end of November for the Big Race. I was excited about them and went off on a few shorter runs. As they had not been worn in properly, my feet became sore and it was painful to walk some days. I took the next few months off running completely, to allow my body time to rest and heal. I spent time gently walking in my new shoes. I reduced the number of hours I was teaching per week to 15. The pain in my knees began to subside and by February, I thought I could start up again. I was feeling nervous as the Great Wall plans were still on and only 3.5 months away. I went for a couple of short runs – but knew immediately that my training would be on hold again. I felt disheartened as my friend was doing regular training back home and was including stairs training. I did a lot of research online and found a very helpful site (www.fix-knee-pain.com), which deals solely with patellar tendonitis. (Yes, I self-diagnosed myself as I felt quite dejected with my previous hospital visit). I began the exercises recommended by Martin Koban, the author of the site. Exercises focused on strengthening the gluteals and the quadriceps, as well as strengthening the patellar tendon (technically a ligament as it connects the knee cap to the shinbone, whilst a tendon connects muscle to bone). I began practising daily. Exercises included squats on a decline, side lying clams, one legged deadlifts, hip abductions, glute bridge and bird-dog, as well as foam rolling all the muscles in the legs and hips and a few stretches. There are 5 phases to the program prescribed by Martin Koban, and I followed each phase for about 2 weeks. Within the first week, I could feel my knees improving. Although it was time consuming, I continued. At first, exercises were performed daily, and as they became progressively harder, the frequency reduced. The pain in the front of the knee, just below the kneecap began to disappear. As we had moved to another location, I also began to go to a nearby gym. I did some general weight lifting, but avoided focusing solely on the legs, in fear that it may make the pain worse. In March, I also went to another doctor as I was alarmed by how often my knees and hips were clicking. I know noticed that the back outside edge of knees hurt, particularly when bending the knee and pointing the knee out to the side (flexion and external rotation of the hip).Almost every movement I made resulted in some part of my body clicking or cracking. Although it didn’t hurt, I knew that it wasn’t a good sign. I went for another x ray, and insisted on getting an MRI to see if there was damage to the patellar tendon. Nothing much was out of the ordinary, other than the fact that my kneecap tracks to the one side too much when the knee is bent and some cartilage had worn away, which would explain why my knees hurt. He prescribed supplements to help rebuild the cartilage and some exercises to help strengthen my legs. For me, as a yoga instructor, surgery is simply not an option (and not one that I would consider even if I didn’t teach). There is no way that I am going to go through 2 months of recovery after surgery, just so I can walk again. I decided to hit the gym and focus mainly on my legs. I got the supplements prescribed, and although they were expensive, I would rather invest in healing and preventing further damage, than spend a lot on an invasive procedure like surgery. I began to train legs twice a week, in addition to the almost daily exercises to strengthen the patellar tendon. I included squats (limited range of motion to begin with), deadlifts, leg extensions and leg press. By April, my knees felt the best that they had felt in the past 7 months. 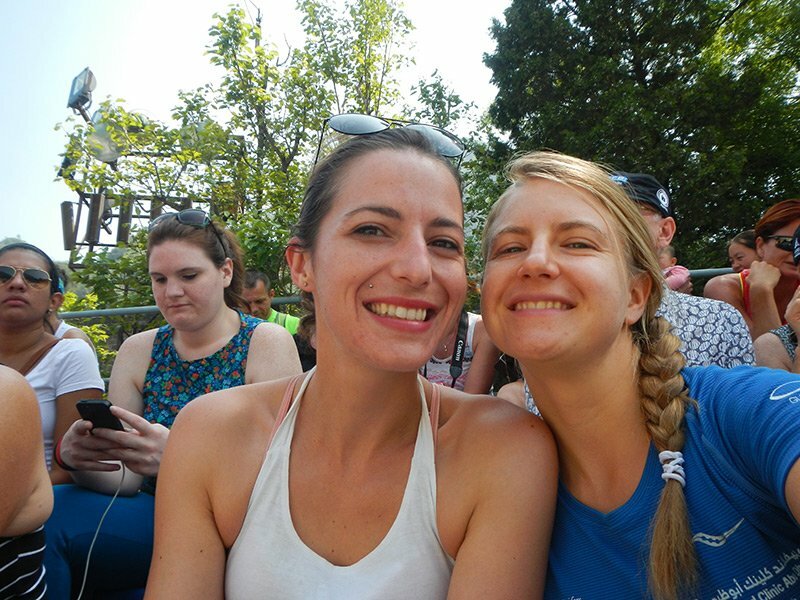 The race was only 6 weeks away, my friend and I had decided to downgrade to the half marathon due to both of us experiencing injury along the way. I felt a bit scared but a lot more optimistic than I had felt before. We began booking our flights and accommodation. 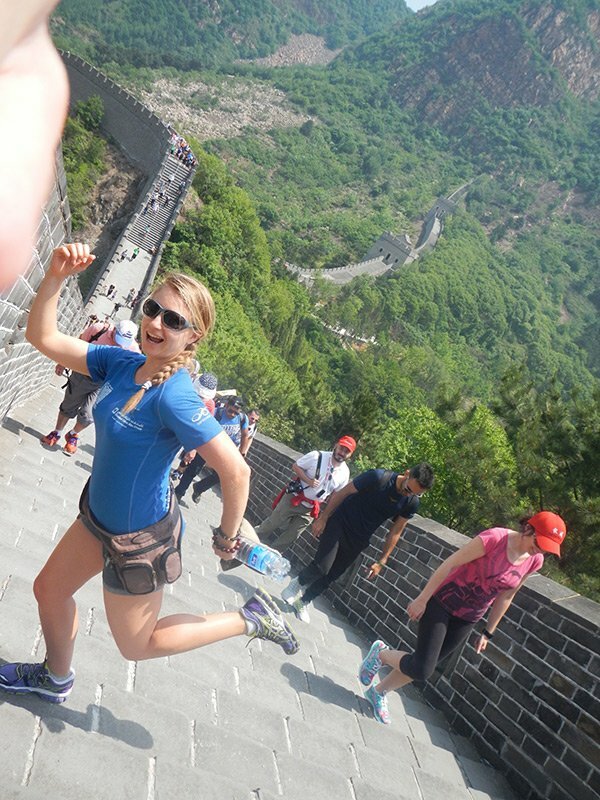 To participate in the Great Wall of China Marathon, you are required to book a tour of a minimum of 5 days. There are some packages that go up to 14 days, but they get progressively more costly. The entries close 2 months before the race. 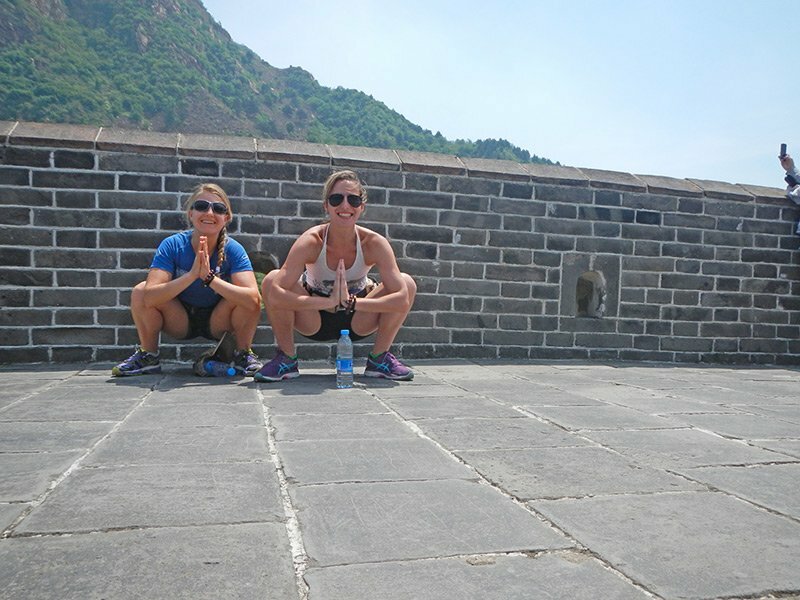 We decided to make our own tour up and visit a few places that we felt attracted to, and spend a total of 12 days in China. During the last 4-5 weeks of training, I focused on strengthening my legs a lot. I began to include lunges and step ups into my weight training program, increased the weights I was pushing and was able to do a couple of 10km runs as well as several 4km runs. My knees felt a little sore after the longer runs, but were great the day after. It felt so good to finally be able to run again! My last workout consisted of: 10-12 reps x 4-5 sets (Squats with kettlebells 10-20kgs; back lunge with barbell 20-40 pounds; Romanian deadlifts 30-60pounds); (leg press and calf raises 40-100kg; leg extension with 5second isometric hold 18-27kg) followed by 2×20 V-ups with a 2-4kg medicine ball and Russian twists with a 10kg kettlebell. My fears that focusing on the legs were completely unfounded. Strengthening the muscles took the strain off the knee joint and helped with alignment. 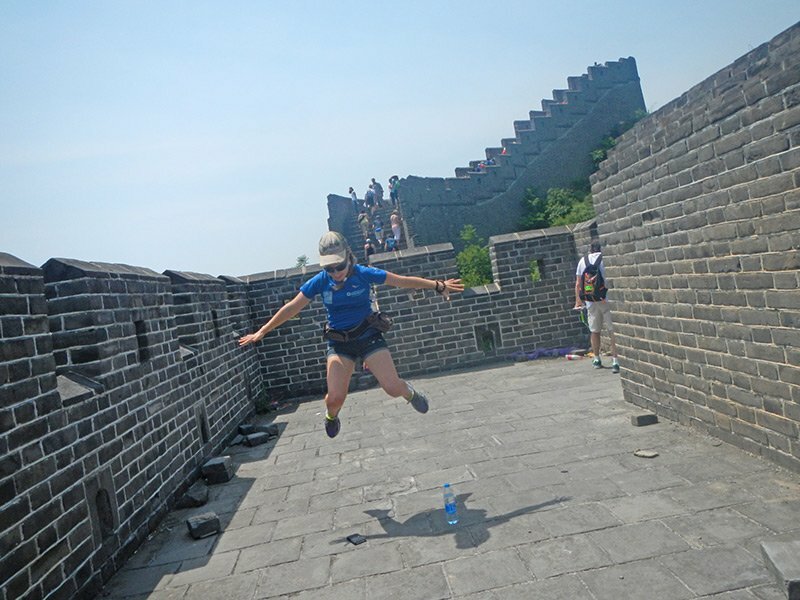 My trip to China was unlike anything I’ve experienced before. There is so much of everything – people, history, land, vehicles, shops and stalls, beautiful scenery. We had a chance to experience the not so touristey-tour orientated side of China before the race tour began, which was incredible. We saw some beautiful parts of the country and experienced the locals, their food and the great language barrier! The weather was a lot more comfortable than it currently is in the Middle East. The day of the race was around 30 degrees at midday, but the morning was cool. 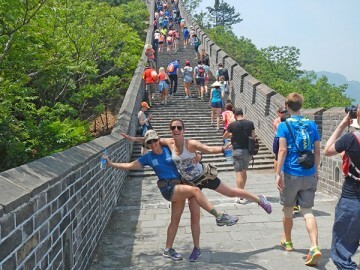 Humidity levels were much lower in China. Day one of the tour consisted of all participants checking into hotels. 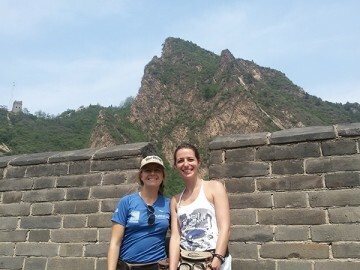 Day 2 was the site inspection, where we had the chance to walk the Wall section we would all be running on, and the program of the day was explained to us. 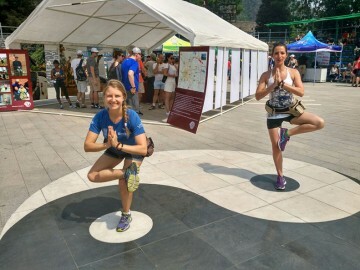 Day 3 was free to go on a tour of the Qing tombs and go to a local market (as we had already gone to see the Terracotta Army in Xi’an, we decided to keep the day free and rest), or to spend as you pleased. Day 4 was race day – 21 May 2016! We awoke early on race day, around 3:30am. We had breakfast and checked out by 4:45am, and left the hotel at 5am. 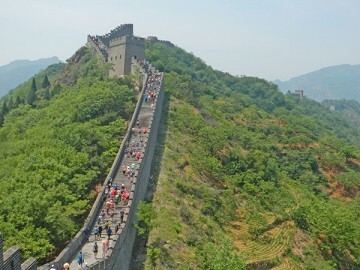 We arrived at the race venue (Huangyaguan Great Wall, Huangyaguan Pass, Jixian, Tianjin) at 6:30am. +/- 2500 runners took part in the various distances (42.2km, 21.1km, 8.5km). The first wave of runners began the race at 7:30am. Three waves followed, each separated by 10 minutes. This helps to delay congestion along the route. 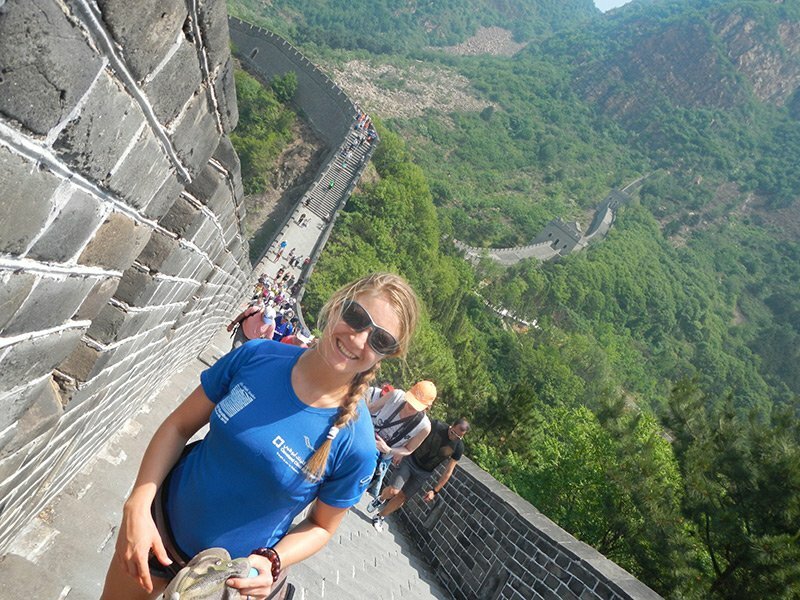 The start of the race began at Yin Yang Square, followed by a 5km incline up to the Wall. If your body was not yet awake, this long uphill certainly did the job. Hello burning calves! Locals from the village and town came to cheer on the runners and kids held their hands out to high five us as we ran by. 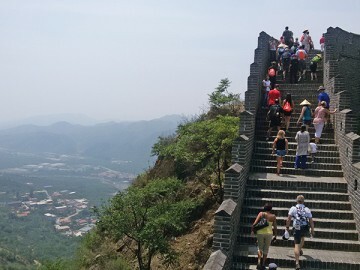 Once at the top of the road, the following 3.5km are spent on the Great Wall, climbing (not running) up countless steps, huffing and puffing along the way. 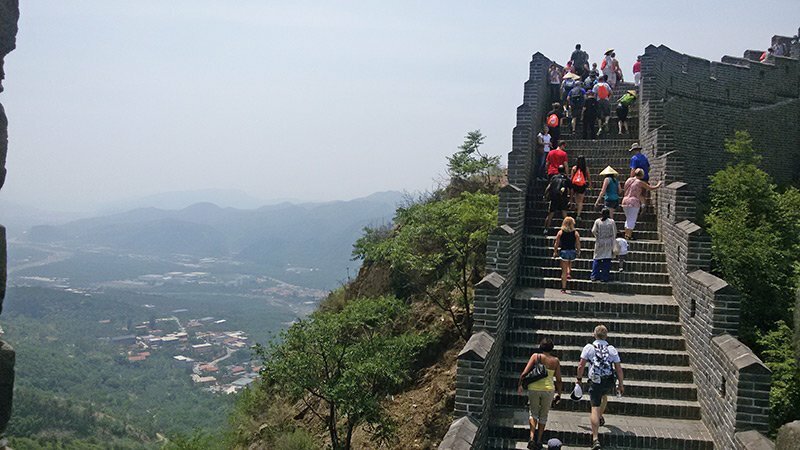 The stairs are not all uphill – there are several sections going down. 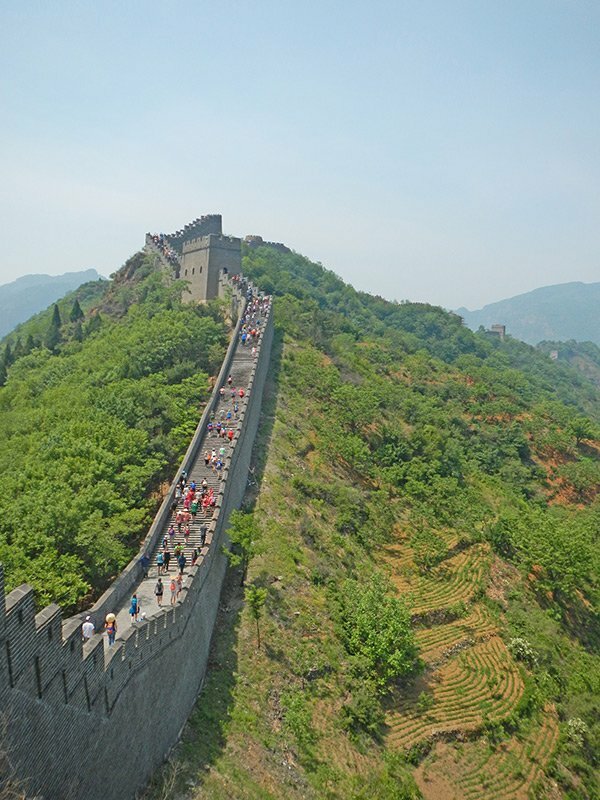 Most of the sections of the wall are quite wide, but there are a few sections that are quite narrow and a little traffic is encountered at these sections. There are amazing views along the way, which you can admire as you catch your breath. The stairs are not all the same height, but the variance was less than I had expected. I did not actually notice the height difference that much – I was paying more attention to my knees being in line with my toes, breathing and staying hydrated. Water points were situated at intervals throughout the race. The last km of the Wall is a fairly steep descent. Care must be taken to prevent falls and injuries. Once you have made it down, it a short, flat run back to Yin Yang Square. 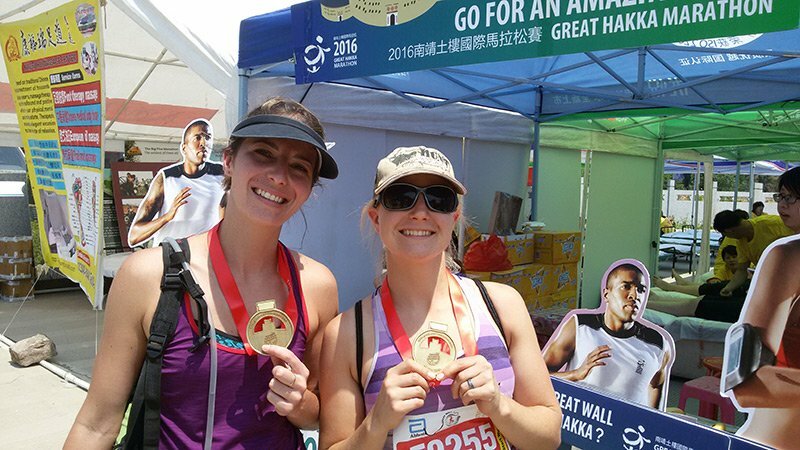 Passing through Yin Yang Square marks 8.5km – the end for the fun runners. For the rest of us half marathoners and full marathoners, we headed back out and onto the longer, flatter part of the race. 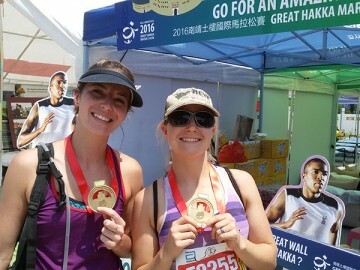 The first 9km took us about 1:40 (a lot slower than I had expected, although we weren’t running competitively for time). We ran along a road for a couple of km before heading towards the local village. Locals were again on the side of the road, cheering us on. So many white people, with big noses! (Apparently our noses are beautiful.) At some point after 12km, the full marathoners branch off and take a different route. The half marathoners continued through the village before heading back towards Yin Yang Square. My knees felt sore the last 4-5km of the race, but I had more discomfort from chafing than from the knees. During the whole race, we took it easy and had frequent walking breaks. We stayed hydrated and had a couple of bananas and sweets along the way. We completed the race in a time of 3:16:16. After the race, we had a free leg massage (feet not included, understandably). Then we picked up our sandwich lunch, sponsored by Subway. We found the bus that was going back to our hotel in Beijing. We arrived back at the hotel a couple of hours later, without our luggage- it was on another bus and would get delivered later. 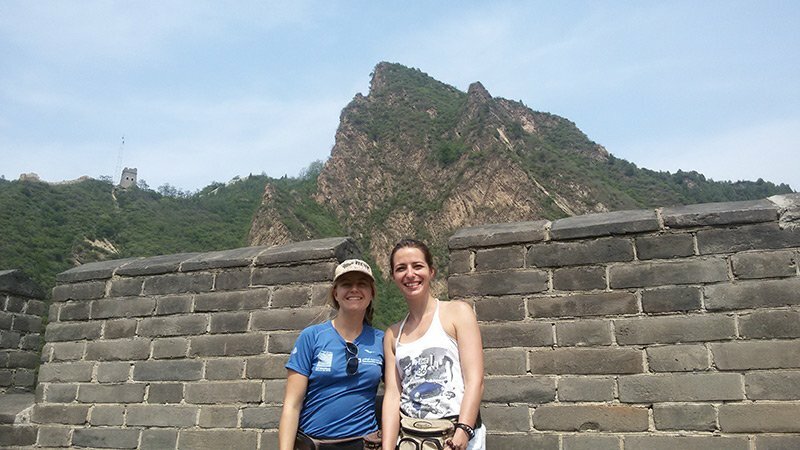 We rested, cleaned up and ate, then we walked a couple of blocks to Wangfujing Street – a famous shopping street, not only in Beijing, but in the whole of China. Here you can buy curios cheaply (if you bargain it down) and try deep fried scorpions, starfish or seahorses, or try smelly tofu, deep fried ice cream, spring rolls, various meat on a stick, local fruits and so much more. The Oriental Plaza, which is equivalent to New York’s 5th Avenue, is right next to Wangfujing. We bought traditional Chinese dresses and walked (very) slowly back to the hotel. Our knees were so sore by this stage that we walked up and down stairs backwards! A well deserved rest was in order! 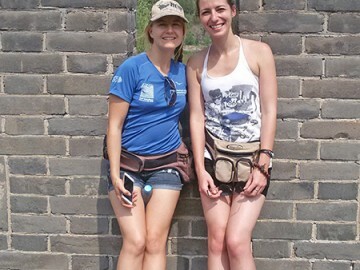 Day 5 was free to explore on our own, or to take one of the tours offered by the race tour operators. 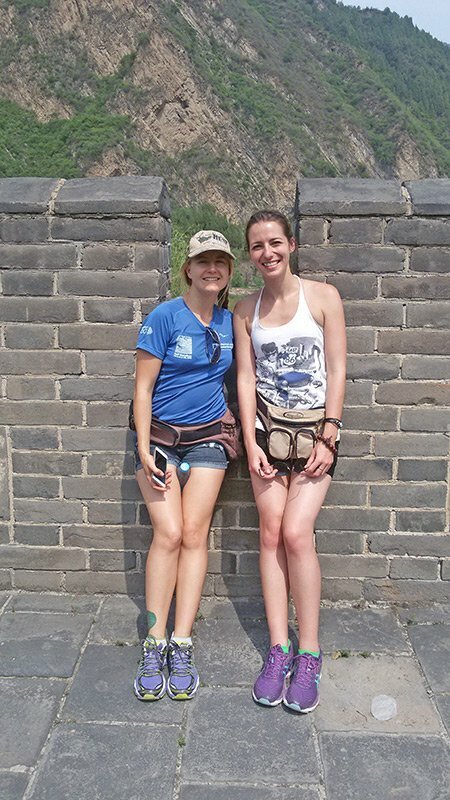 We went to the Temple of Heaven and spent several hours viewing the ancient architecture and enjoying the gardens. The race Gala Buffet took place that evening at a conference centre somewhere in Beijing. There was an after party for those that wanted to celebrate even more – we met some really fun people during the dinner and continued on at the after party! The bus took us to a bar in East Beijing and we spent a few hours there before catching a taxi back to our hotels in Central Beijing. Many people were flying out a few hours later. 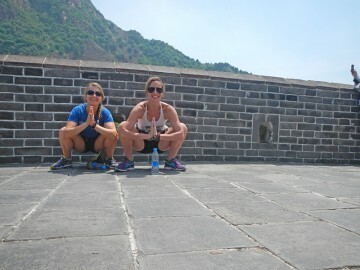 We had another 2 days in Beijing to tantalise our senses and blow our minds! It was an incredible experience and one that I would love to go back to do over again – with one change. To attempt the full marathon! I am grateful for all the challenges I experienced along the way, all the injuries I incurred. My injuries taught me to include strength training when training for an endurance event, how important rest days are, to pay more attention to my body, to modify accordingly, even if it means that the ego gets severely dented. Rather allow the ego to take a beating than to let your body get injured. Your body is your temple, and it allows you to do and experience so many amazing things – so love yourself! At the end of the day, life is about having beautiful experiences, meeting others and enjoying your life – whatever you choose to do. Leila is a Personal Trainer based in Abu Dhabi – UAE who provides Yoga personal training and teaching. You can contact Leila with your personal training questions or make a booking from her profile page. For personal trainer news in Dubai, Abu Dhabi & Sharjah, special offers, promotions and more click the button to the left to return to the News & Offers section of the UAE Personal Trainers website.